Fasten Musique Concrete has started a party with a concept of cutting edge European sound in London.The party is being developed and soon will be fully prepared for the launching of our own label Fasten Musique in Tokyo. 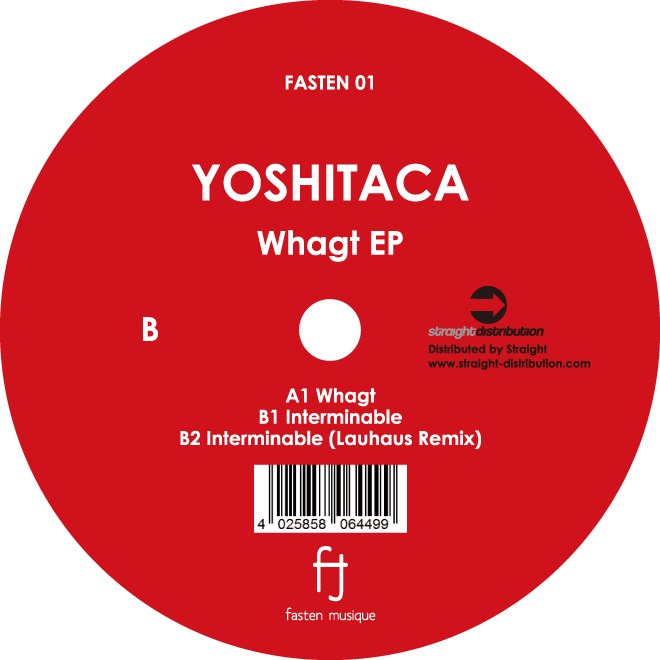 Resident DJ / producer Yoshitaca of Fasten Musique is going to drop the first release. Side A ”Whagt”has a delicate tone and rhythm with modern and unique sound in a deep atmosphere. Side B ”Interminable” is not only minimal but also dynamic sound with fat and funky bass line. The top producer Lauhaus of the Netherlands runs his own label Soweso and We Dig. Music is working as remixer for our upcoming release. He is also well known as the unit’s Polder with David Labeij and has been releasing top labels such as Get Physical、Viva、Supernature、Intacto、 Remote Area and Sushi tech, besides his own label. The remix of this “Interminable” is the techy sound with deep sub bass, and you can feel the powerful groove from which his sound style evolved.